Back in January, a report surfaced that the next installment in the Fast & Furious franchise, Fast & Furious 8, will be partially shot in Iceland, with shooting scheduled to begin in April. It seems production is already under way in the arctic country. Though a new report from TMZ reveals that an unusual tragedy has already happened on set. The site reports that a local horse named Jupiter died after being struck by a fake iceberg prop that was sent flying in the air by gale force winds. Both Jupiter and another unnamed horse were reportedly grazing in a paddock near the set, when strong winds sent part of a fake iceberg towards them, striking Jupiter and breaking its leg. The injury caused Jupiter to be euthanized, although the other horse is expected to recover. Neither Jupiter nor the second horse were part of the production, but they were both simply in the wrong place at the wrong time. Members of the production reportedly called the horse's owner and broke the news, and said that insurance would cover the cost of the horse and damages to the fence. In January, Akranes, Iceland mayor Regína Ásvaldsdóttir, confirmed that Fast & Furious 8 is expected to start shooting in his town sometime in April. This report doesn't say exactly where the accident took place, but Akranes is approximately 28 miles north of the Icelandic capitol of Reykjavík. That report also claimed that the production plans on pulling off the biggest explosion ever seen in the country, with shooting set to take place in Akranes harbor and in a location known as the Cement Fields. 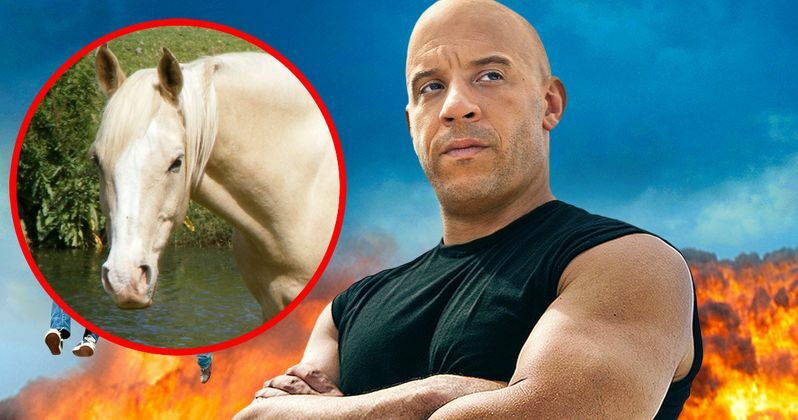 It isn't known if any of the franchise's stars, such as Vin Diesel, were present for the accident, and it isn't known what exactly was being shot at the time of Jupiter's death. Iceland is just one of the many global locations Fast & Furious 8 is set to shoot in, with shoots also taking place in New York City, Atlanta, Cuba and Russia. Sad as it may be, this sequel isn't the only production to experience an on-set tragedy in recent months. We reported in September that Olivia Jackson, a stuntwoman working on Resident Evil: The Final Chapter, was placed into a medically-induced coma after being involved in a horrific accident. She was placed into a coma for two weeks, and later had to have her left arm amputated because the injuries were so severe. We'll keep you posted with more updates on Fast & Furious 8 as production continues, so stay tuned for more from the set.